Longtime guest on here, and I enjoy reading stories and checking out the pics people post. Well, I believe I have a pic others may enjoy�..but gotta work on the story. Got the 1st week off in October from my teaching job and my wife and I headed outta state to an area we hunted 3 years ago. Only I had a deer tag this time. I started to experience spot and stalk hunting in AZ during the winter archery seasons 5 years ago, and thoroughly enjoyed it (3 hunts, multiple opportunities, no harvest, but tons of fun). Hunting Ca blacktail in timber, or along dense river bottoms is a bit different than glassing. The area we hunted 3 years ago had both, timber and sage, and we were able to spot nice deer in the sage. Got to the National Forest area we had made home 3 yrs ago and parked the trailer. It had been raining, and snow was forecast for the 1st 2 days of the season. The rain turned the jeep trails into snot�.and was going to keep us out of the area I wanted to glass for the multiple days�..I was so bummed out�I had planned on heading in a couple miles and spot and stalk hunting each day�..now I was going to be forced to hunt the dense timber. Woke up at midnight to a crazy lightening storm right over us and pouring rain. After a fitful couple hours of sleep we got up early opening morning to snow and very strong winds. Drove 15 miles into the N.F. to park and walked to saddle I�d seen deer sign in the last time we hunted there. 25 mph hr winds, horizontal snow, couldn't see 150yds�..miserable. After a while decided to head back to camp eat breakfast and take a drive to my wife�s antelope unit so she could get her 2nd doe and access the upcoming weather forecast. She got her antelope and we headed back to camp. Found out a winter weather alert was forecast for that evening and the next day. As we were driving back in the N.F. rigs and trailers were piling out��do they know something I don�t? They didn�t have animals, they were leaving ahead of the strengthening storm. Saw one spike and 4 does all day. I think animals were hunkering down. Woke up the 2nd day and it was 20 degrees, and snowing hard. The storm was forecast to blow strong all day and then clear up, so I was looking forward to the days after it broke. Still hunted multiple skid trails during the day. Almost zero tracks�..nothing seemed to be moving in this weather. Hunted near that saddle in late afternoon. Now�..here is the spot that serious mule deer hunters may want to skip��just scroll down to the pic. 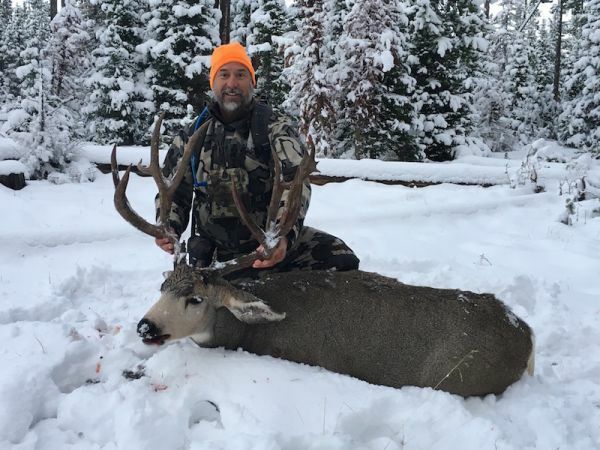 You may throw up a little in your mouth�..I think my good friend (serious mule deer addict) and spot and stalk mentor did when I shared this with him the next day. He threatened to give up hunting mule deer and toss out his hunting gear when I told this to him, as it took him 20yrs to break 190�, and that was just last year��. Frustrated, cold, not seeing animals, we decided that we wouldn�t see animals on their feet until the next day after the storm blew out. We hopped in the truck and headed back to the trailer with more than an hour and a half of hunting light left. Tomorrow was going to be the day, I wanted to make an early dinner and call it a day. A mile from camp, as I was looking out my window I caught a glimpse of a huge framed deer ~50 yrds into the timber, in an opening not much longer than he was, looking the other way. I told my wife to stop, I hopped out, went around a stand of small pines, saw him still looking away, tried to ignore the headgear and shot. He ran 50 yds and piled up. I knew he had a big frame, but I really didn�t now what I shot. As I walked up I saw his huge body, but his head was behind a tree, when I came around the tree and saw it I lost my breath. The next few minutes were a blur. My wife joined me, and she took some pictures, I didn�t double check the pics or take the time to really take the time to get good field pics, I was like a robot, it was like I was in a fog. I could not believe what I had shot. We were close enough to the truck to actually drag it there. Unbelievable. The biggest deer I�ve ever seen (and likely will ever see), and I harvested it a mile from camp, spotted from the forest road. Crazy. I have to assume he was either heading down lower from the higher area that got 20 inches of snow, or had just gotten up and was moving as the storm broke. Either way��.he was my Luck Buck. I think I used my luck for the rest of my lifetime at that instant. 1. "RE: Luck Buck Monster"
Wow, that is a beautiful buck congrats. 2. "RE: Luck Buck Monster"
19. "RE: Luck Buck Monster"
3. "RE: Luck Buck Monster"
4. "RE: Luck Buck Monster"
5. "RE: Luck Buck Monster"
Many many years ago I was driving back to camp during the middle of the day and spotted the biggest buck I�ve ever seen with a tag in my pocket. Unfortunately he was on a mission and I was unable to get a shot off. You never know when one will show up. 6. "RE: Luck Buck Monster"
Luck plays some role in nearly every hunt. 7. "RE: Luck Buck Monster"
Way to go on a buck of a lifetime. These little episodes where a smart old buck is right by the road is something all of us have envisioned or dreamed of seeing after working hard and headed back to base camp defeated. Thanks for sharing the story and pics. 10. "RE: Luck Buck Monster"
Congratulations! You may have been lucky, but you put yourself in the right place, at the right time, with the right gear, and had the skill set to do what you had to do, to get the job done. I call that being prepared when the opportunity presents itself. That is absolutely a tremendous mule deer. And............. you didn't pack up and walk away, because you didn't have to sneak across three ridges, two canyons, and wade a raging river to get to it, like some folks insist on doing to consider it a legitimate hunt/kill. Just taking the opportunity to rag on Founder and the purists a little, cuz I'm a bonafide jerk. Very happy for you and Momma!!! 8. "RE: Luck Buck Monster"
Congrats, that is a real STUD! What a beautiful buck, always be paying attention, sometimes it works out like it did for you! 9. "RE: Luck Buck Monster"
Nice job!! I think most of the time I�d rather be lucky than good, but being lucky is putting yourself it the position to be lucky.... nice job and congrats on a excellent buck!! 11. "RE: Luck Buck Monster"
Stud of a buck there my friend! I appreciate the honesty in the story. Incredibly refreshing to hear the whole truth about how it played out. Too many guys only telling what makes them look best. Always twisting the perception of things. Again awesome buck and a great story. Thanks for sharing it. It made my day! 12. "RE: Luck Buck Monster"
Loved it for all the afore-mentioned reasons. Congrats on a fatty! 14. "RE: Luck Buck Monster"
Judas that�s a nice deer. "That's a special feeling, Lloyd"
13. "RE: Luck Buck Monster"
WOW!!! What an absolutly beautiful Buck. I Love the chocolate colored horns. Cool story as well, congrats! 15. "RE: Luck Buck Monster"
Congrats on an amazing deer! Given the antelope reference and the mention of out of state hunting, I'm guessing this is a Wyoming buck??? 16. "RE: Luck Buck Monster"
As big as that deer is...... the looks of your face are beyond priceless. It looks like if someone asked what your name is you wouldn�t be able to say it. Awesome!!!! 17. "RE: Luck Buck Monster"
Sometimes it is better to be lucky than good. Congratulations on a monster buck. Do you have any additional photos of his rack that you can share. It is tough to see what exactly he has on his left side against the backdrop of your camo. 18. "RE: Luck Buck Monster"
20. "RE: Luck Buck Monster"
Here is pic from straight on, wish I would have gotten this angle in the field. 21. "RE: Luck Buck Monster"
Huge. That left side is cool. Congrats and thanks for sharing. 22. "RE: Luck Buck Monster"
23. "RE: Luck Buck Monster"
24. "RE: Luck Buck Monster"
Good Lord, it's even bigger than it looks in your field pictures. I'd a shot straight in the air!!!! 25. "RE: Luck Buck Monster"
26. "RE: Luck Buck Monster"
31. 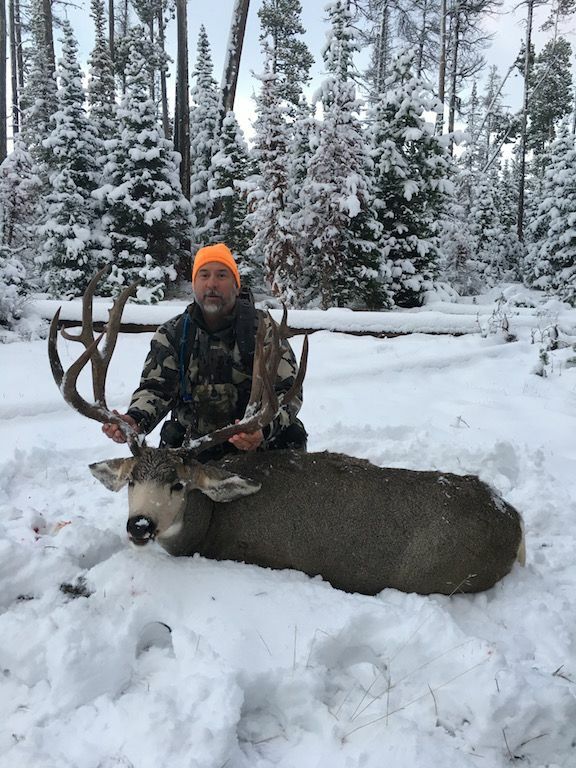 "RE: Luck Buck Monster"
Wy. I live in Northern CA, but I started spot and stalk hunting mule deer in AZ. 27. "RE: Luck Buck Monster"
Great Buck and Great story! I think you should call that buck Opportunity, because when Opportunity knocks,you better be ready to open the door! 28. "RE: Luck Buck Monster"
29. "RE: Luck Buck Monster"
That�s an absolute pig congratulations on a fine buck. 30. "RE: Luck Buck Monster"
32. "RE: Luck Buck Monster"
Thats an awesome story & an awesome buck congrats to you!!! Nothing wrong with being lucky!!!! 33. 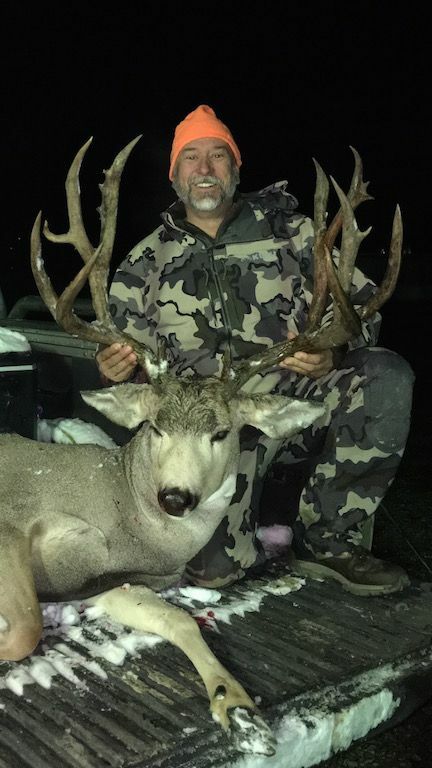 "RE: Luck Buck Monster"
Fantastic buck! Everyone dreams of "lucking" in to a buck like that. 34. "RE: Luck Buck Monster"
IMHO you hacked out the storm and took your chances...it paid off! Stoked for you!!! HUGE CONGRATS!!! One heck of a MULEY!!! 35. "RE: Luck Buck Monster"
36. "RE: Luck Buck Monster"
My goodness what a buck!! 37. "RE: Luck Buck Monster"
38. "RE: Luck Buck Monster"
39. "RE: Luck Buck Monster"
That Bugger is huge, Wife turn now take a big one. 40. "RE: Luck Buck Monster"
41. "RE: Luck Buck Monster"
That buck is a serious slug. Very cool. Congratulations.